Update, 4 p.m.: We're signing off of our live coverage of the San Francisco March for Science and other marches around the state and country. If you missed our live one-hour radio special, you can listen below. Hosts Scott Shafer and Craig Miller talked with reporters and scientists in California and across the country to capture the feeling of today's marches. And check out the best photos and most creative signs from today's march in San Francisco. 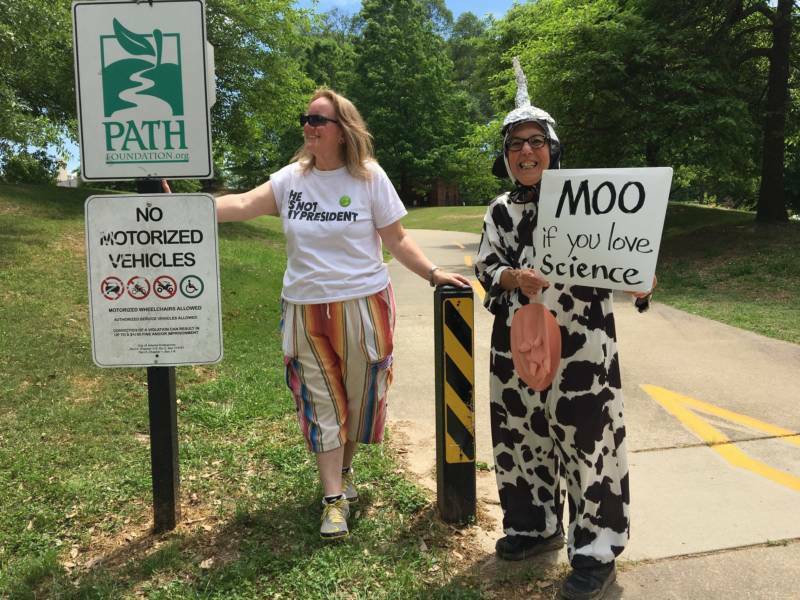 Update, 3:45 p.m.: Thousands of people of all ages are taking part in marches for science across the state today. 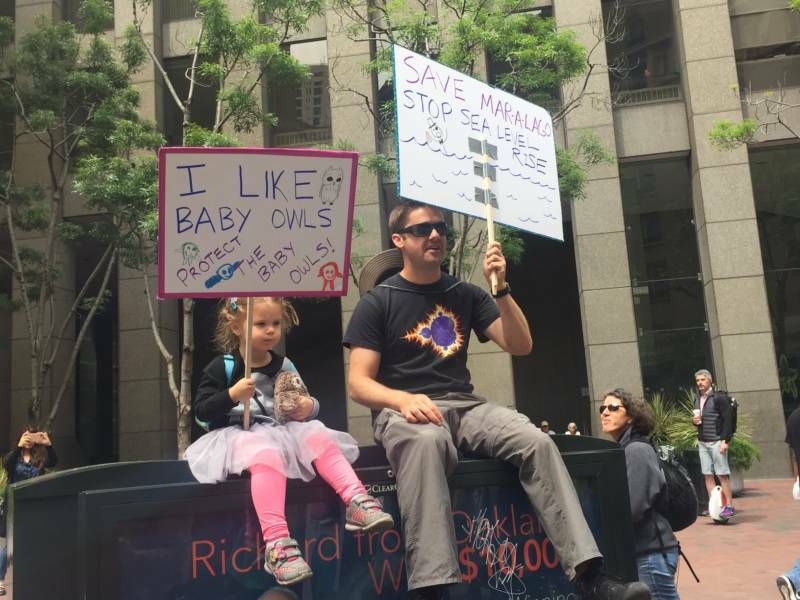 James Balkite brought his daughter Parker to the San Francisco march. He is one of many people who's worried about the federal government's attitude toward science. "I'm hopeful that the current administration will take science more seriously, more seriously than it has so far," he said. Parker wants to make sure the burrowing owls she sees at home in Mountain View are protected. 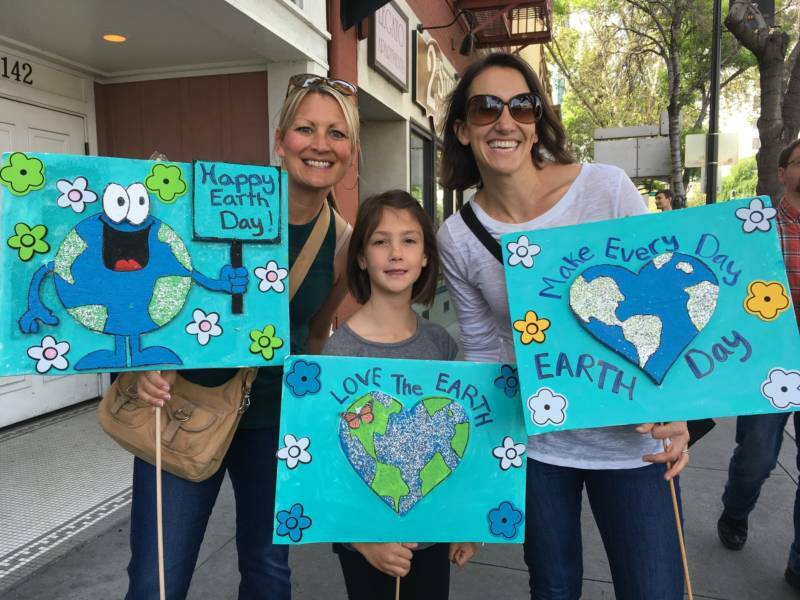 Christina Nosek is one of many educators taking part in marches. She teaches fifth grade in Palo Alto, and she says she and other teachers are worried about the impact this could have on their students. "Being teachers it's kind of personal because we're teaching kids to make decisions based on evidence, not talk," Nosek says. 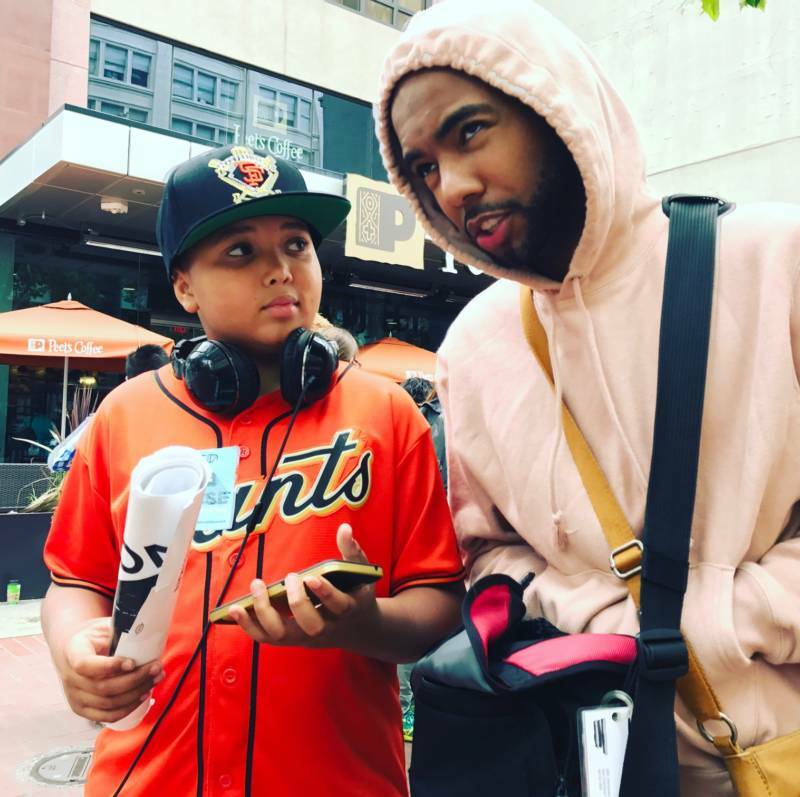 KQED Learning's Above the Noise team was also at the march in San Francisco talking to young people about what science means to them and why they felt the drive to come out and march. "I'm here because I like science experiments and support science," said Jadyn Washington of Parkway Heights Middle School. John Barron showed up to the march in San Francisco in his United States Geological Survey (USGS) t-shirt. He recently retired after working for the USGS for 40 years working on historical records of climate change. He's worried that the work he's dedicated his life to will be under threat and funding could be cut off to the scientists continuing his research. "Science is very clear that there is a human effect on climate warming," Barron said. The Comic Con fans in San Jose weren't the only ones getting dressed up for the marches today. Larnie Fox, an artist from Benicia, says he came to the San Francisco march to defend human rights. "Information is precious and anyone who tries to deny it is messing with one of humankind's basic rights," Fox said. Many of those taking to the streets are doing so because of the direct impact science has had on their lives. Lori Mandell is a lawyer and cancer survivor from Alameda. 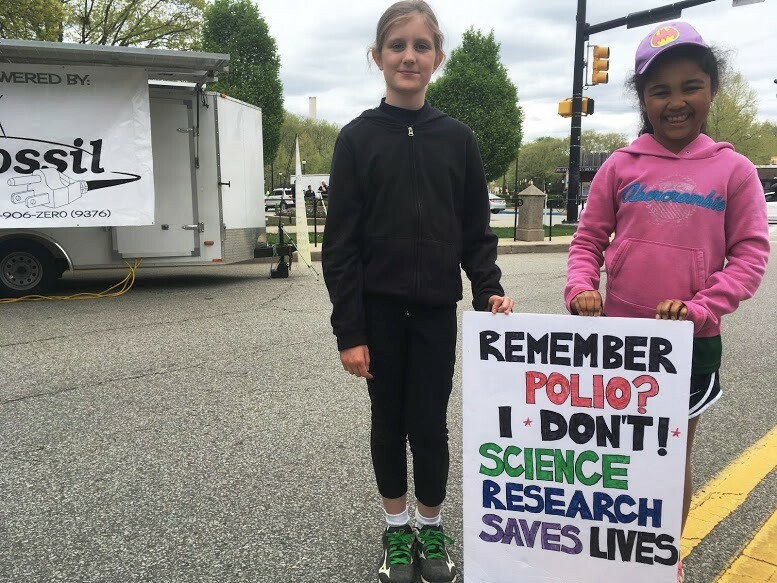 "I wouldn't be alive without science," she says. Update, 3:30 p.m.: Also in Washington D.C. today, scientists gathered at the Smithsonian Institution’s Earth Optimism Summit, to share stories about where science is working to solve problems around the planet. One of the speakers was Steve Palumbi, director of the Hopkins Marine Station in Pacific Grove, who shared the story of the recovery of Monterey Bay. One of his favorite stories from the day is an effort called Pristine Seas to protect some of the last wild places in the oceans. “Fabulously wonderful places full of corals and kelp and fish and mammals,” he says. A National Geographic crew conducts research and makes documentary films of these locations, then shows them to the governments that have jurisdiction over them. So far, Pristine Seas has protected 4.5 million square kilometers of ocean. He says one reason people don’t seem to value environmental science is that scientists haven’t done a good job explaining why it’s helpful. By contrast, he says, in a lot of cases environmental science is used to define the problem. That’s where scientists have to do a better job at communicating solutions, Palumbi says. Update, 2:30 p.m.: Outside of San Francisco, other marches in support of science are also happening across the state, country and world. In San Jose, the March for Science Silicon Valley is taking place right next door to Silicon Valley's Comic Con. Organizers say more the crowd totals more than 5,000 people. 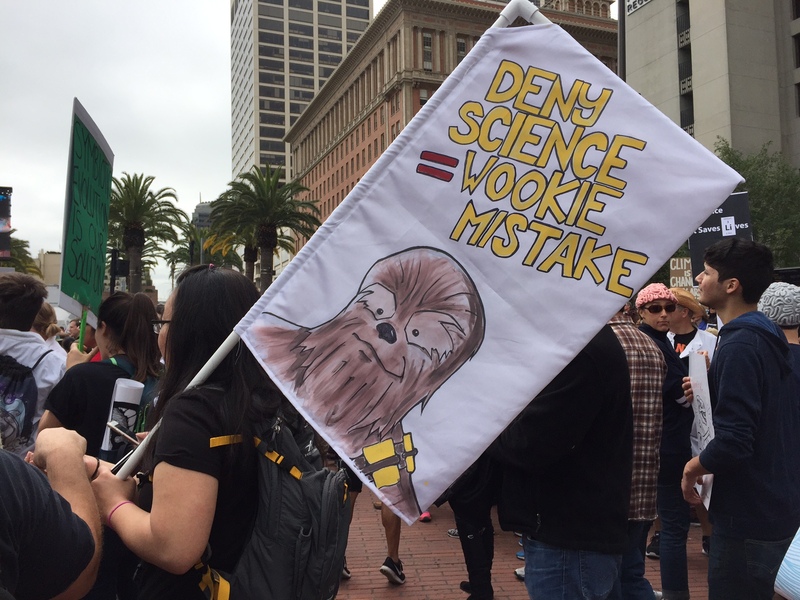 "It's a wonderful scene," said Tim Ritchie, founder and CEO of The Tech Museum of Innovation in San Jose, as he walked through crowds of people in March for Science shirts and Star Trek uniforms. "It's a real celebration of all things geeky." Ritchie echoed other speakers from across the state today on the dangers that face society like pandemics, natural disasters and climate change that he says can only be tackled by scientists from around the world working together. He said Silicon Valley, a community built upon and around science technology, needs to lead the way in defending science and using technology for "the global good." "I think we need to turn to our technologies that benefit humanity and that are globally good," he said. "There's lots of talent here that might be turned to more superficial and ephemeral things, but there's a whole world that needs the brilliance of Silicon Valley to use technologies to create economic opportunity to alleviate suffering as opposed to building the next music app." 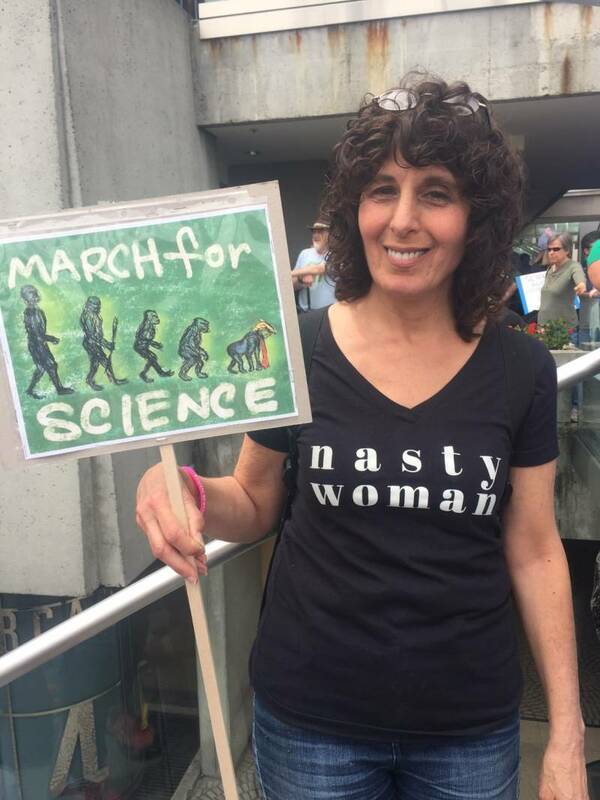 Michelle Duennes, an organizer of today’s march in Riverside, says she’s coming down from her research site in Yosemite National Park to demonstrate how science matters for people everyday. Duennes tracks native bumblebees around Sierra meadows, to find out whether they’re getting the nutrition they need from local flowers. These are the bumblebees that pollinate tomatoes, blueberries, and many of the fruits and vegetables on Americans' dinner tables. The main March for Science is taking place in Washington D.C. where Jonathan Foley, the executive director of the California Academy of Science was one of the featured speakers. 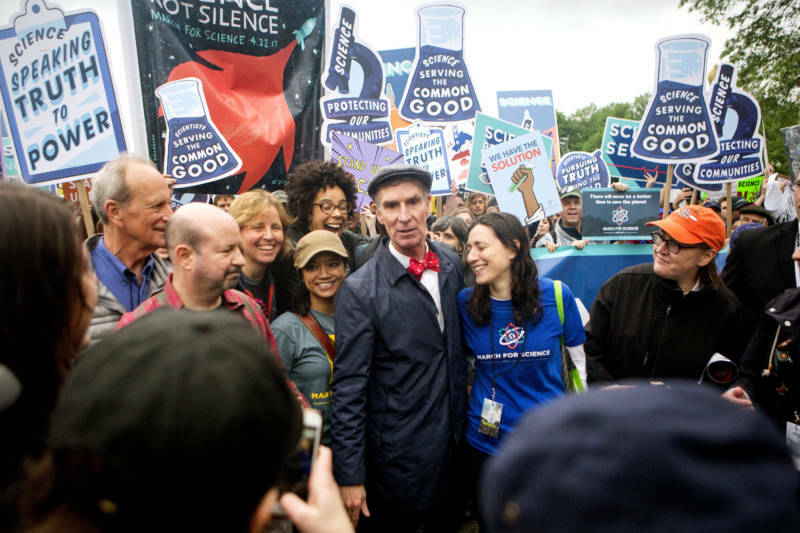 He said thousands of people brought a positive energy to the rain-soaked streets of Washington D.C. to defend science. "This is something different," Foley said of the Trump administration's attitude towards science. "What we're seeing now is a deliberate attack on the science that keeps us from harm: science that deals with our health, our safety and the environment. And that's really dangerous for all Americans." He said it's taken this striking attitude toward science that's made scientists -- a group Foley called "a pretty introverted bunch of folks" -- stand up and take to the streets. He had strong words for the scientists who feel that marches like the one's taking place today are a mistake and risk politicizing science. "I have no patience for scientists who are saying, 'No, we shouldn't get political, let's hide out in our laboratories.' Well, give up your damn research grants, then, because you aren't serving the Americans who are paying your salary. You aren't doing your job," Foley said. 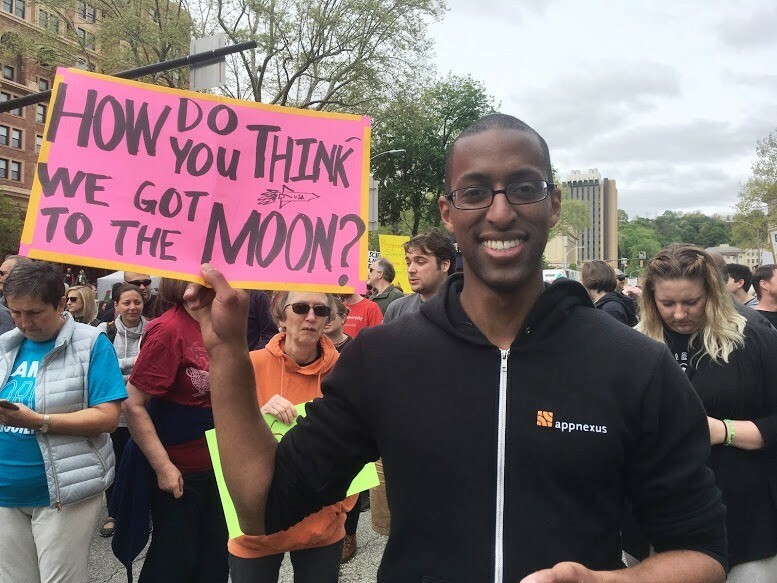 While he was participating in the main march in Washington D.C., he said people are looking to California and the Bay Area in particular to lead on science issues. "I think people are looking less at Washington as a leader but more as an obstacle," Foley said, "and the Bay Area as a true leader with a clarion call for science serving the world." Update, 1 p.m.: Tune in now as The California Report and KQED host a live statewide radio special on 88.5 FM. Hosts Scott Shafer and Craig Miller will check in with reporters and scientists around the state and in Washington D.C. on what’s happening and why scientists are marching. Update, 12:30 p.m.: Speeches are underway at the San Francisco March for Science. MythBusters host Adam Savage has just taken the stage to speak to the thousands assembled at Justin Herman Plaza. His first words to the crowd? "Seriously, I can't believe we have to do this." Speakers have focused on the threats that the scientific community -- and American society as a whole -- face if fact-based science is disregarded. "Rare diseases don't wait," said DJ Patil, former U.S. chief data scientist. "Finding cures requires investments in all science." Kathy Setian, a retired project manager at the Environmental Protection Agency (EPA), warned the crowd about what she says are the dangers of politicians and corporate interests having an undue influence on science, specifically calling out current EPA administrator Scott Pruitt. "We are marching to defend and expand our hard won protections and in solidarity with others who remain resolved and organized against these threats," Setian says. In response, the crowd took up a chant of, "Science, not silence!" Chris Field is the director of the Woods Institute at Stanford University, but he's attending the march as a private citizen concerned about what will happen if the world stops seeking out and relying on fact-based evidence. "If we have a society that's based on a careful evaluation on the information that's available, we're going to be a better society," Field says. "We're going to make better decisions and better choices about the issues of our era." 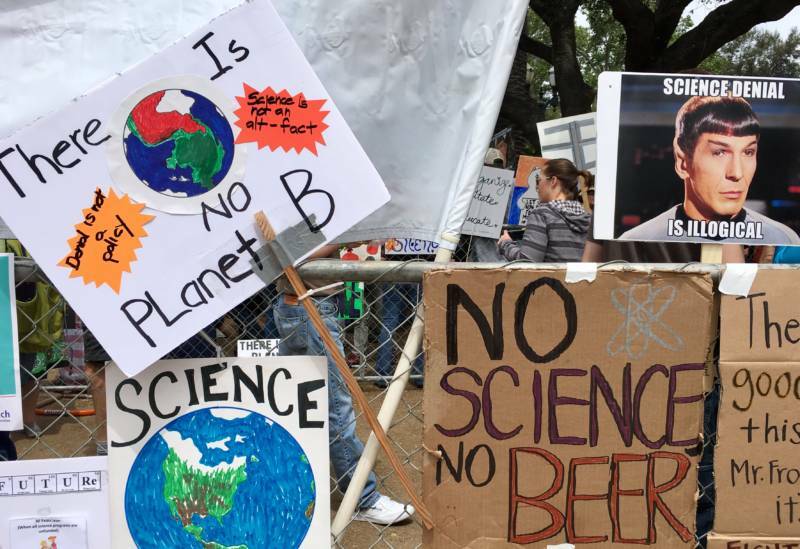 Update, 11 a.m.: More than 1,000 people have made their way to Justin Herman Plaza in San Francisco for the city's March for Science. You can watch a live feed of the speeches taking place on our Facebook page. 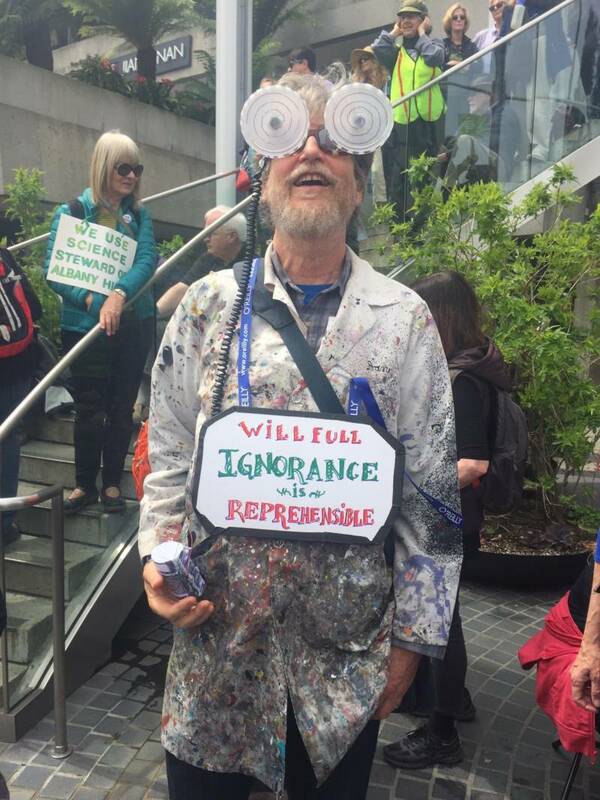 Many of them are toting creative signs that display their motivations for taking to the streets to support science today. People of all ages are out in force preparing to defend science. 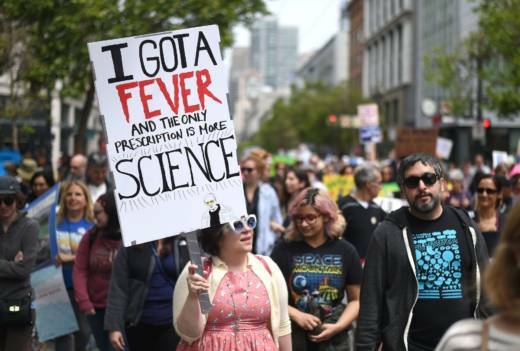 By 10 a.m. this morning, several hundred people were already gathered in San Francisco's Justin Herman Plaza in solidarity with the nationwide March for Science. More than 40 rallies are expected throughout California today. The San Francisco march officially starts at 11 a.m. and KQED will be live blogging the event on this page, broadcasting via Facebook live and creating an Instragram story live from the march. You can also follow our coverage on Twitter at @KQEDScience. Keep checking this page as we post photos, quotes and more. 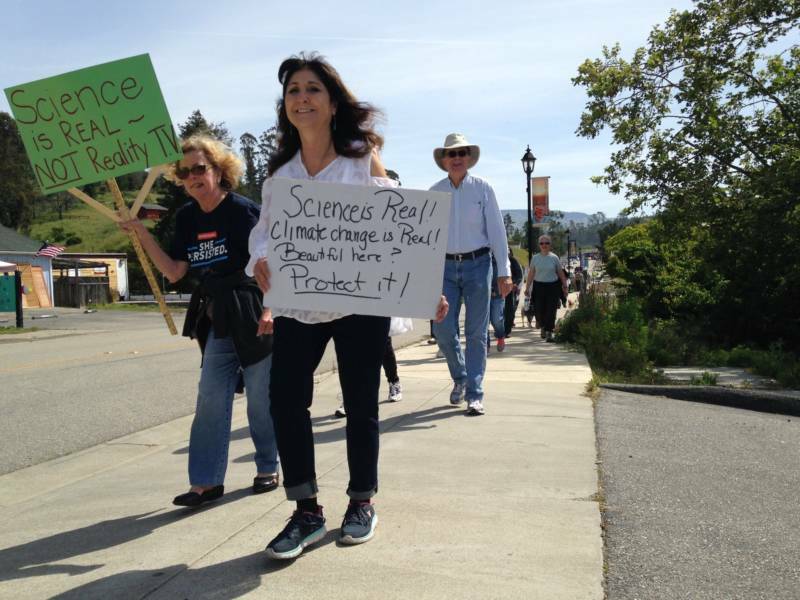 From 1 p.m. to 2 p.m. you can also find our live radio coverage on 88.5 FM as KQED hosts Scott Shafer and Craig Miller check in with reporters and scientists around the state and in Washington D.C. on what’s happening and why scientists are marching.